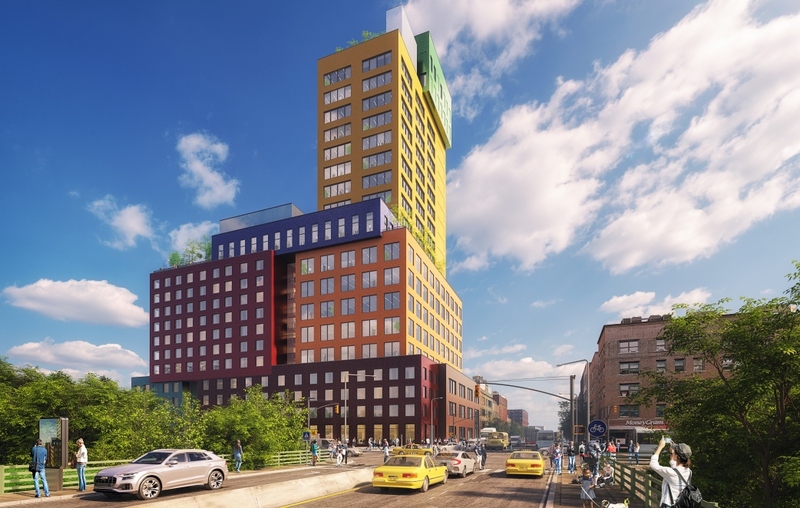 On November 15, 2018, the Netherlands-based firm MVRDV broke ground on Radio Tower & Hotel, a 21,800-square-metre mixed-use high rise located at 2420 Amsterdam Avenue in the Washington Heights area in northern Manhattan, New York City. The 22-story building combines hotel, retail, and office functions in vibrantly stacked blocks, reflecting the vivacious character of the neighbourhood and setting a direction for the future development of the area. Completion of the building is expected in 2021. Long-time REVITALIZATION readers are already quite familiar with MVRDV’s many wonderful urban redevelopment projects in Europe. This is the firm’s first major project in the United States. 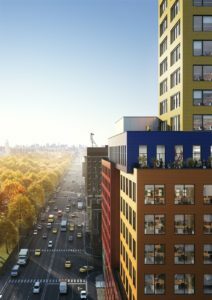 Designed for developer Youngwoo & Associates, Radio Tower & Hotel will occupy a currently underutilised lot at a crucial intersection: where Amsterdam Avenue meets the Washington Bridge, which connects Manhattan to the Bronx; and just one block away from the I-95 highway, one of the major links between Manhattan and New Jersey via the George Washington Bridge. The distinctive massing of the building resolves the project’s main challenge: accommodating a large volume of program while remaining contextual. Radio Tower & Hotel takes the typical composition of a small block in Washington Heights, pulls it apart and then reassembles it into an asymmetrical stack of boxes with openings and roof terraces. These boxes are designed to appear like separate buildings: each is roughly the same size as others in the neighbourhood and features its own specific window pattern inspired by the nearby buildings. 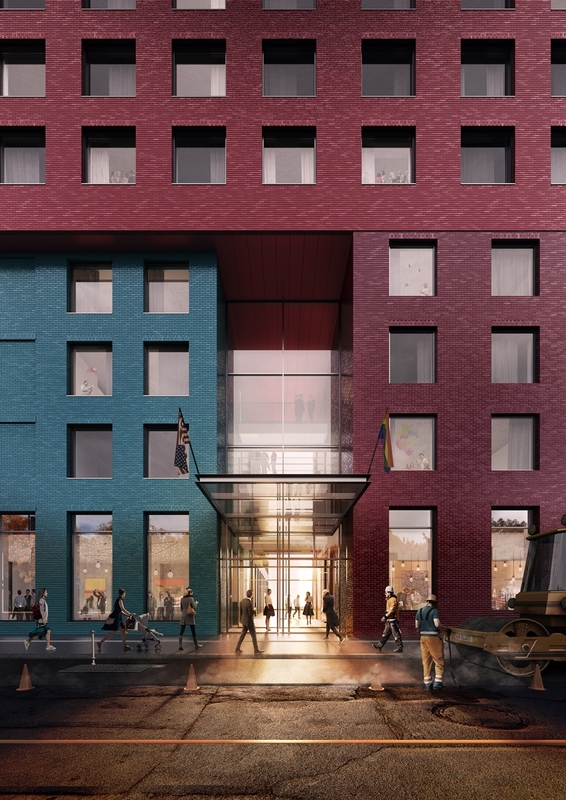 The boxes also take inspiration from the vibrant colours of the shopfronts in the majority-Hispanic neighbourhood, with each part of the building being finished in a different colour of ceramic bricks. Combined, the elements of the building’s external appearance form a condensation of the characteristics of Washington Heights’ existing urban fabric. Inside, Radio Tower & Hotel provides an answer to the area’s need for a diverse range of hotel rooms, workspaces, event spaces and retail units. Washington Heights is the 5th largest neighbourhood in New York with a population of over 150,000 people, but it is currently served by just two 50-room hotels. 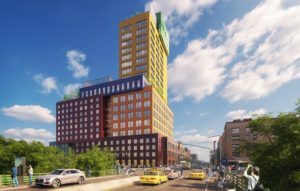 The Hotel will therefore be an important hub for those traveling for conferences hosted by the Yeshiva University and the New York Presbyterian Hospital, both of which are located nearby. Meanwhile, the event space located in the building’s blue volume will add a facility that did not previously exist in the neighbourhood, offering locals a space to host weddings and other parties with spectacular views from the adjacent rooftop terrace. 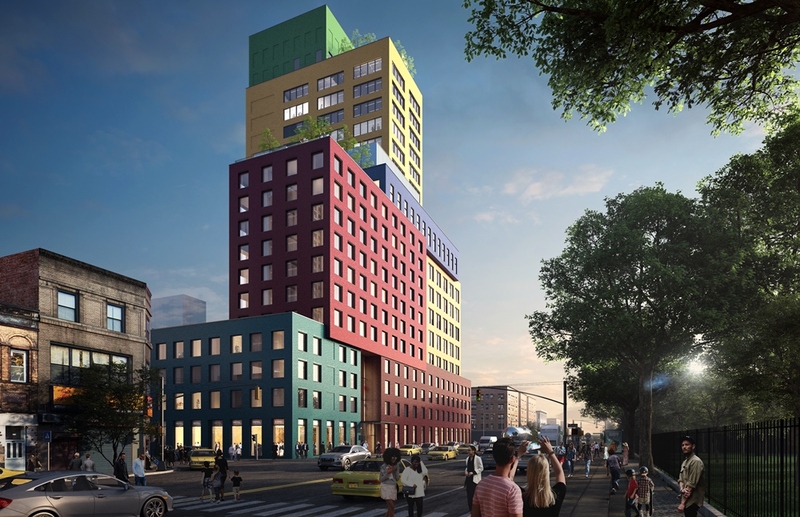 “Radio Tower & Hotel, located at the thinnest part of Manhattan Island between the Hudson and the Harlem River, is a colourful new building which will strengthen an already wonderfully mixed and vibrant neighbourhood,” explains Winy Maas, principal and co-founder of MVRDV. “The building forms a ‘vertical village’ with blocks that are the same size as the surrounding buildings, thus avoiding the common drawback of large developments in which new skyscrapers overwhelm the existing character of the city. It will be a colourful, welcoming beacon for people entering Manhattan,” he added. 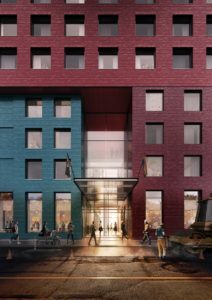 MVRDV is collaborating with executive architect Stonehill & Taylor and a team of experts including Workshop APD for interiors, Cosentini Associates for building systems, GACE for structural consultation, CANY Technical Services for façade engineering and Filament Hospitality. The planned completion date for the building is sometime in 2021.